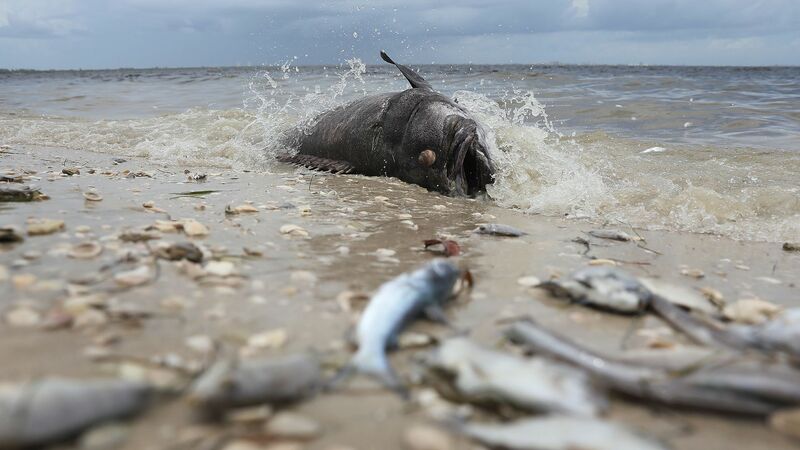 Red tide, a toxic algae bloom found in saltwater, now spans well over 100 miles of Florida's western coastline, killing and sickening marine life and damaging the economy. The ongoing red tide event is unusually severe and long-lasting this year, causing major fish kills, and making people cough and choke when they visit area beaches. Why it matters: Now in its eleventh month, cities from Sarasota to Naples are suffering on many fronts, and there's little people can do but wait. Details: There are still plenty of unknowns when it comes to red tide: it seems to start offshore, but nutrients washed off land from agriculture or inland algae can worsen an existing bloom. Marine mammals, sea turtles and other marine life have paid a hefty price during the bloom. There have been more than 50 sea turtle deaths in the last month, including green sea turtles, loggerheads and Kemp's ridley turtles, which are designated as critically endangered. According to Gretchen Lovewell, Mote Marine Lab's strandings investigation program manager, these animals become ill upon contact with the red tide. The annual average number of sea turtle deaths in Florida is 100. This year has already seen 137 fatalities, Lovewell said. A 26-foot long whale shark washed up dead on Sanibel Island in Florida in late July, potentially making it the first of the iconic species to fall victim to brevotoxins and neurotoxins found in red tide. An official cause of death is pending further investigation. Quote"The neurotoxins make them very uncoordinated in the water and have trouble moving their flippers or lifting their heads. They then have seizure-like episodes and many die. Mollusks like mussels or oysters are filter-feeders. They can absorb the toxic algae and become toxic to eat. Humans can suffer just by being near infested waters. Toxins from the algae reach the air and can be inhaled, causing bronchial constrictions. For most, this results in uncomfortable coughing, but for people with asthma or breathing problems it can be dangerous. The economy suffers too. Florida attracts visitors who come for the state's beaches and fishing opportunities. How it works: Mary Kilfoyle, who's lived in Fort Myers since 1963, told Axios she's never seen a red tide like this in her lifetime. Beachfront businesses and restaurants are closing because people don't want to be near the water, she said. "How long can you survive with a closed business?" Scientist and director of the water advocacy group Calusa Waterkeeper, John Cassani said he's seen "real estate deals get lost [due to the] perception that this will be an ongoing problem in the future." Many believe red tide is caused by the algae in inland areas like Lake Okeechobee, but that connection hasn't been scientifically proven. Lake Okeechobee has suffered from its own prolific algal bloom this year, and some of those waters, when released from the lake, could make it to the ocean. But nutrients flowing to the ocean from freshwater are more likely to be consumed by algae in brackish water, rather than making it to the sea. What's next: This red tide bloom is the worst in over a decade, and it's become a major issue in the hotly contested Senate race between Florida Republican Governor Rick Scott and incumbent Sen. Bill Nelson. Some people suspect the state's agricultural interests, such as the sugar industry, are causing some of these blooms through pollution. Kilfoyle said these blooms are engaging "people who normally don't get involved in political issues. You can't go on a walk and not be affected by it." Cassani said that may be the only silver lining to the harm. "It's a wakeup call, and people are demanding action from the officials we elect to keep our water healthier."